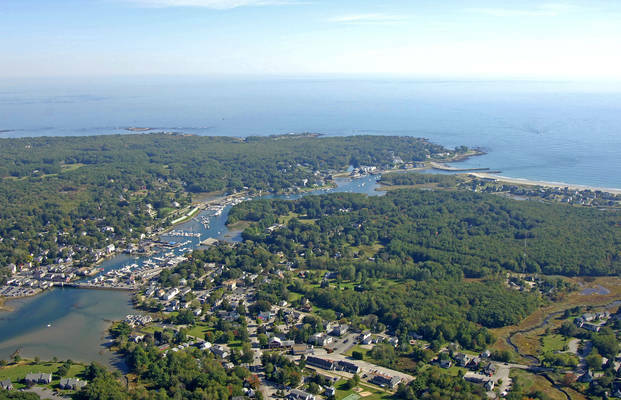 Kennebunkport, primarily known as the location of George H.W. Bushs summer vacation home, but it is also a popular destination for recreational boaters. 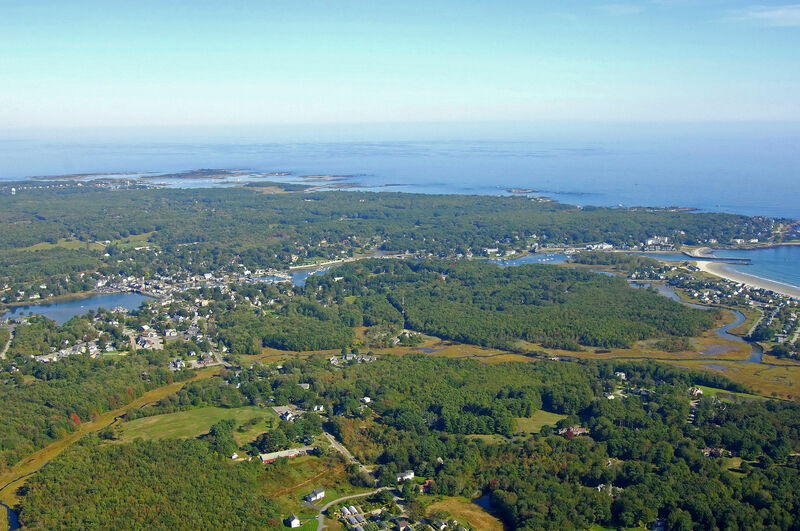 Kennebunkport is 20 miles northeast of the New Hampshire-Maine state line and 25 miles south of Portland. The image above is a view from the east looking west over the town of Kennebunkport, and Kennebunkport River where it empties into the Atlantic Ocean. 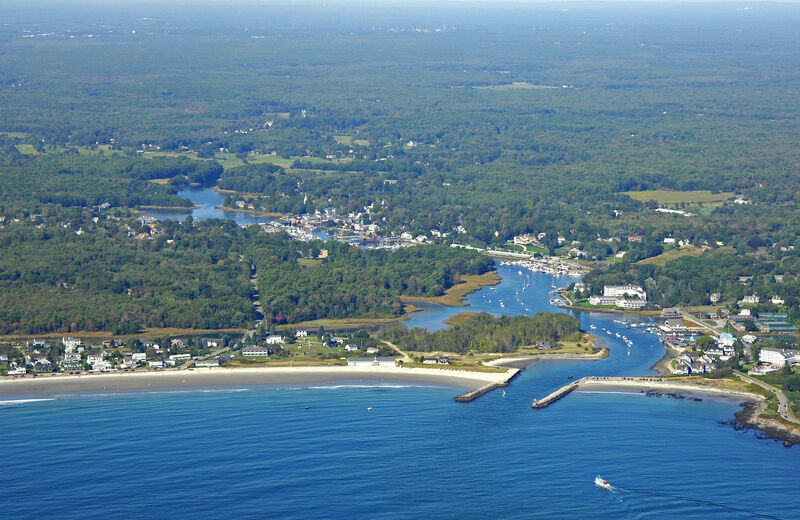 Coochs Beach is located on the left (south) side of the Kennebunkport River Inlet, while Old Fort Point is just out of the image to the right (north). 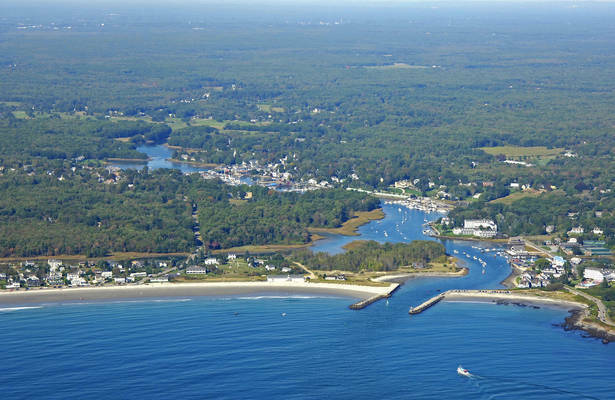 There are four marine service and marina facilities located in Kennebunkport, and all but two of them accept transient guests at their slips. Chicks and Kenenbunkport marinas are located very close to the Kennbunkport River Inlet. If you need gas or diesel fuel, the following marinas pump both; Chicks Marina, Performance Marine and Yachtsman Marina. 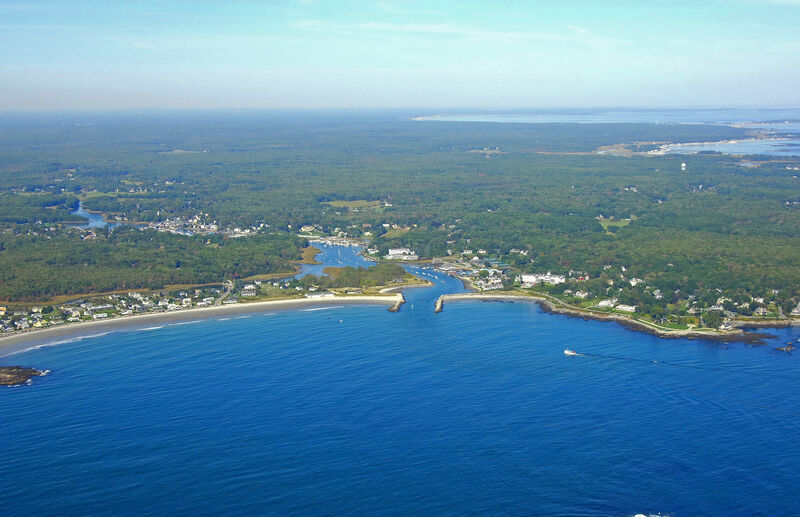 Thousands of years ago, Native Americans made seasonal trips over land to the Kennebunk Plains to hunt, and the name Kennebunk is believed to be an Indian word meaning long cut bank a likely reference to Great Hill at the mouth of the_Mousam River (at Parsons Beach). As the lumber industry grew, vessels came to load sawn timber for houses and ships. The local shipbuilding industry began first on the Mousam River in the 17th century and then on the more navigable Kennebunk River. Shipbuilding continued into the early 20th century, making wealthy men of the areas shipbuilders, merchants and sea captains. As shipbuilding was waning, new industries were taking its place. By the early 1800s, power generated industries were already flourishing along the Mousam River, giving rise to Kennebunk factories that made cotton, thread, twine, shoes and even trunks. By 1872, the Boston & Maine Railroad was carrying a new cargo on the three-hour trip to and from Boston: tourists. The group of cottages that started going up at Cape Arundel in 1874 represents one of the finest examples of a turn-of-the-century colony in Maine. 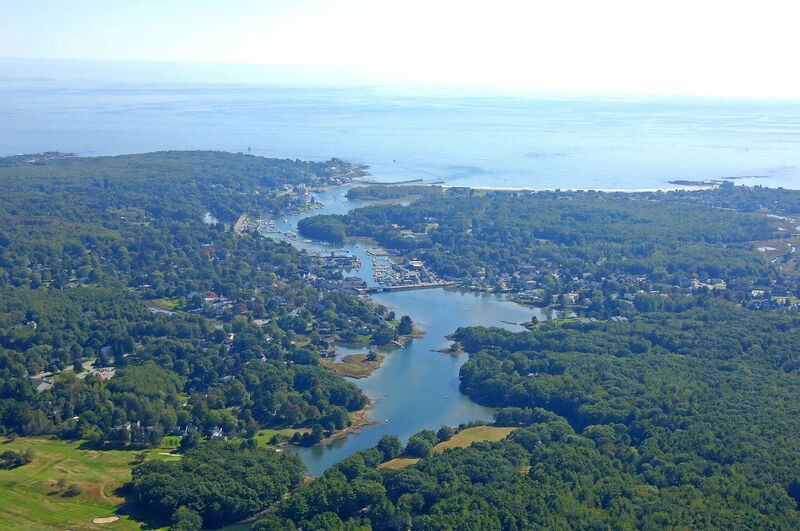 By then, Goose Rocks Beach and Cape Porpoise were established resort destinations as well. The number of large hotels dwindled with the increasing popularity of the automobile and the opening of the Maine Turnpike. In the 1970s and 80s, easy access to the Kennebunks attractions made them appealing year-round destinations. The Main Street village area has been carefully revitalized with keen attention to its history and architectural integrity. Kennebunkport too has maintained its old Maine charm with a vibrant commercial district and scores of historical buildings on lovely elm-lined streets. Few destinations offer todays visitors the opportunity to experience hundreds of years of Americas past. The Kennebunks are alive with history, coupled with 2005 luxury and convenience. The town of Kennebunkport and the Kennebunkport River are reached via a passage through the Atlantic Ocean from the south. From green can buoy 3, you will start in on the final approach to the jettied Kennebunkport Inlet. From green can buoy 3, set and follow a course of about 001 degrees magnetic for approximately six-tenths of a mile to intercept green can 5, which is located just off the south inlet jetty. Flashing red 6 is located on on the north jetty and makes for an excellent guide in towards the inlet at night. Once inside the inlet jetties, a series of can buoys lead you up into the Kennebunkport River and the town of Kennebunkports waterfront. Portland International Jetport is located approximately 30 miles from Cape Porpoise/Kennebunkport and is served by American Airlines, Continental Airlines, Delta Airlines, US Airways, United Airlines and Northwest. Ground and area transportation to and from the airport is readily available. The Manchester NH Airport is located approximately 75 miles from Cape Porpoise/Kennebunkport. Served by Air Canada, Delta Airlines, Continental Airlines, Northwest Airlines, Southwest Airlines, United Airlines, US Airways, Pan Am Clipper Connection. Ground and area transportation to and from the airport is readily available. No reviews yet! Be the first to write a review of Kennebunkport.